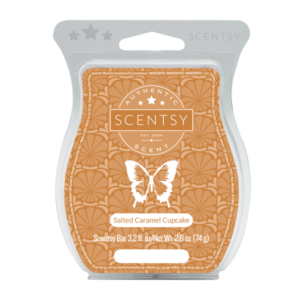 Experience the fragrance of salted caramel goodness with our Salted Caramel Cupcake Scentsy bar. This scented bar has hits of soft caramel, cocoa, sea salt, and moist, buttery cupcakes. SALTED CARAMEL CUPCAKE SCENTSY BAR IS NO LONGER AVAILABLE. Add this Scentsy bar your list of favorites, because our Salted Caramel Cupcake Scentsy Bar wax refill smells delicious: A creamy golden caramel with hints of cocoa and delicate pink sea salt crowns a buttery cupcake. Add 4-5 cubes of a Salted Caramel Cupcake Scentsy wax bar to your favorite wickless candle warmer and fill the room with this favorite bakery scent. Scentsy Bars have a very low melting point and are best experienced when used as a system in an electric Scentsy Warmer. With over 80 long lasting fragrances, including our Salted Caramel Cupcake Scentsy Bar refill, there’s sure to be a favorite for everyone. Each Salted Caramel Cupcake bar is scored to easily break into 8 cubes, and contains 3.2 fl. oz.